GLASGOW, SCOTLAND – May 31, 2018 – As part of its commitment to supporting the continued growth of multiplayer stealth-em-up Murderous Pursuits , developer Blazing Griffin launched its major May update today. 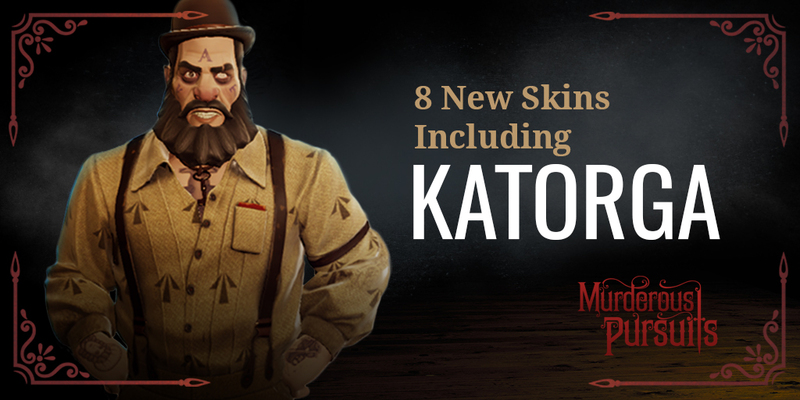 From an integrated party system, to a whole host of brand new prestige skins for players to unlock as they complete achievements and gain favour with Mr. X, this is only the beginning of what players can expect from Murderous Pursuits in the coming months. For instance, this month’s update focuses on improving the community’s quality of life. With the new integrated party system, players can now link up with their friends, enemies and frenemies in-game, making it easy to jump between murderous matches of mayhem. For the competitive players, a new ranking system has been introduced – prove you’re the best and rise to the top! Couple this with brand new unlockable win screen taunts, Calling Card icons and achievements, and players have even more incentive to get out there and hunt their quarries! ● Partying – The party is on! You can now party with up to seven friends (enemies or frenemies – who are we to judge) and join games together. ● Kairos Rank – Prove your worth and move up the ranks, killing your fellow passengers on your way to the top! Can you become Mr. X’s most favoured ahead of every other player? 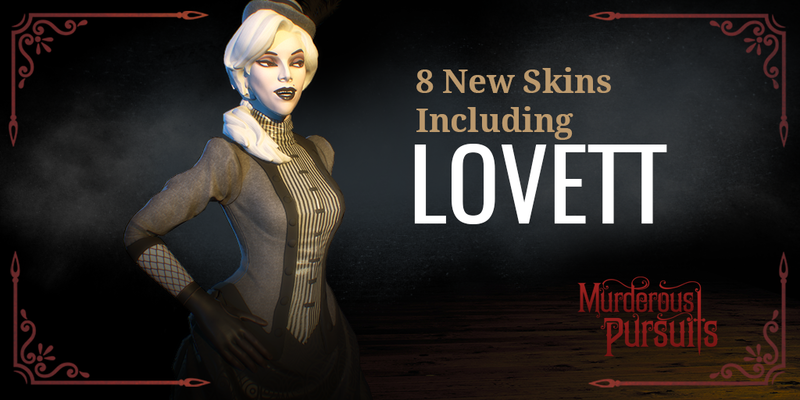 ● New Skins – We’ve added a new set of skins for each character, be the belle (or beaux) of the ball and the envy of all when you rock up in them! ● Win Taunts – You can now choose which taunt to mock your unworthy opponents with on the winner screen, including two new unlockable taunts for each character. ● Achievements – For all you completionists out there, we’ve added 44 more achievements for you to unlock. Show off your proudest achievement through our Calling Card system. ● Connection Manager – Players will now be returned to the main menu if the internet connection drops while searching for a game. ● Players cannot join Quick Play games when no internet connection is established. ● If the host loses their internet connection in a quick play game they will have their server shut down. ● Fixed player Calling Cards being displayed as bot icons on the scoreboard. ● Fixed sound settings applied on the Main Menu not being applied in-game. ● Fixed audio spam when loading into a lobby. ● Fixed inactivity prompt getting stuck on screen. ● Fixed host player not being kicked at the end of a game due to inactivity. ● Fixed chat not working after minimising the game window. ● Fixed camera movement returning after opening Chat while the Esc Menu is present. ● Fixed default “Resolution” option not reverting when selected. ● Fixed “Disable Hints” option not reverting when Back or Default settings were applied. ● Fixed “Player Profile” button flickering on hover-over. ● Fixed icons overlapping text on the failed to find a suitable private game screen. ● Fixed some localisation issues. Murderous Pursuits is out now on Steam (PC), retailing for $19.99 USD for the Standard Edition, and $29.99 USD for the DeluXe Edition, including exclusive character skins, a digital art book, and more. 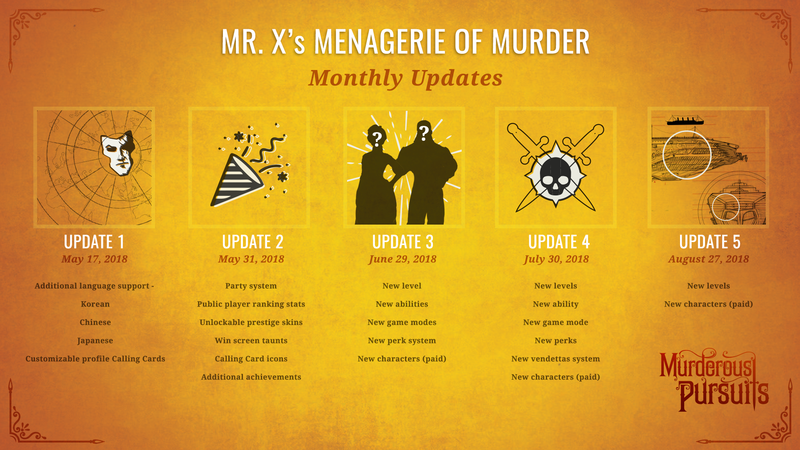 Plus, from May 31 (1:00pm EDT) to June 4 (3:00am EDT), receive an extra copy of Murderous Pursuits with every purchase of the game on Green Man Gaming so you can party with your pals (it’s on us!). For the latest updates, visit Blazing Griffin’s official website and follow the game on Discord , Facebook and Twitter . ● The smartest killer wins: Play solo or online with up to 8 players. Identify your quarry, plan their extravagant murder and set it into motion, all before another player wises up and does the same to you! Blazing Griffin is on a never-ending journey to craft new worlds and bring them to life in the content it creates. Founded in 2011, the studio has expanded to include a group of synergistic divisions spanning Digital Games, Film/TV Production and end-to-end Post-Production services. As an independent digital entertainment group based in Scotland, Blazing Griffin continues to expand its focus on cross platform storytelling and creating new intellectual property alongside its successful digital game titles The Ship and Distant Star as well as its film Anna and the Apocalypse . Headquartered in Glasgow, the Company also has staff based in Edinburgh and London.